surgical ward. I stop eating red meat. Because I couldn’t stomach eating bloody red meat and going to clean red bloody surgical rooms. Walter Pickens and I worked the swing shift, (3:00pm – 11:00pm.) We had to change into surgical green uniforms and shoe covers before going in to any surgical rooms. When we came to work there would be one or two rooms where surgery was in progress. So we had to check all four rooms to see if any needed to be clean. This was an easy 8 hour shift. You may wonder why it took two guys to do one or two hours of work. Because no surgical room could be left unclean over night. There was the possibility contaminated blood left for only a few hours could infect the next patient in that surgical room. If Walter or I were sick and couldn’t come to work the other one would have to be there Monday – Friday. Or no emergency surgery could be schedule after hours without Walter or I were there. I had been on the job about two months. When our supervise came to tell Walter and I that emergency surgery was schedule for after hours that evening. And that one of us had to stay, scrub and get ready to be one of the surgical team. Walter said,” I am not staying.” Being the newbie I had to stay as the “Young Doc” in surgery. two doctors and two nurses. They couldn’t list me as a janitor as part of the surgical team. So I was listed as Dr. Jason A Lewis Jr.
During surgery I was an observer; which last for about three and half hours. Doctor Jones said, “Dr. Lewis you can do the next amputation.” And I said, ” no problem Doc.” After surgery I had to take the thigh that had been wrap up in brown paper and place it in the morgue and place it into the freezer. I carried it under my arm against my side. Degrading tissue had set in on the thigh and cause it to heat up more than my body temperature. It felt like a warm ham against my side. Then I had to go back and clean the surgical room. When I came to work that next day. I wanted to know how our patient was doing. I was told, he had pass that same night, before I came to work. I didn’t know him personally but, I felt that we had fail to save his life. He waited too long to come the hospital for treatment on his foot, because he didn’t have health insurance. This is one example of why we need Obama’s Health Care Plan. This patient came into the Emergency Room of this hospital and had 4 operations. All in that health care plan were billed for this patient‘s hospital care. Which make you pay a higher premium for your health care. When there are more people enroll in a health care plan. Your premium will be reduced. 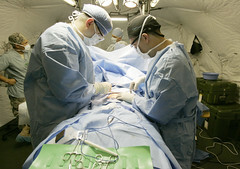 This entry was posted in Work & Career and tagged amputations, emergency surgery, Hospital, hours of work, Mexico, red meat, Surgery, surgical team, thigh. Bookmark the permalink.